"A military coup is the nuclear option"
Zimbabwe’s military says it has seized power in a targeted assault on “criminals” around President Robert Mugabe who it is claimed were causing social and economic suffering. However, assurances have been given that the 93-year-old leader and his family are “safe and sound”. Zimbabwean soldiers and armoured vehicles blocked roads to the main government offices, parliament and the courts in central Harare. On the streets, it seems to be business as usual. Eyewitnesses say Zimbabweans are going about their normal day. Soldiers deployed across the capital and seized the state broadcaster after Mugabe’s governing Zanu-PF party accused the head of the military of treason. It comes after military chief General Constantino Chiwenga threatened to intervene to end a purge of his allies in Mugabe’s Zanu-PF. Chiwenga’s unprecedented statement represented a major escalation of the struggle to succeed Mugabe. Two hours later, soldier overran the headquarters of the ZBC, Zimbabwe’s state broadcaster and a principal Mugabe mouthpiece and ordered staff to leave. Several ZBC workers were reportedly manhandled according to two members of staff and a human rights activist. Shortly afterwards, three explosions rocked the centre of the southern African nation’s capital, according to witnesses. The military detained Finance Minister Ignatius Chombo on Wednesday, according to government sources. Chombo was a leading member of the so-called ‘G40’ faction of the ruling ZANU-PF party, led by Mugabe’s wife Grace. It has been vying to succeed Mugabe. What has Robert Mugabe said? Nothing so far. Neither he nor his wife Grace have responded in public to Chiwenga’s remarks. State media did not publish his statement. The head of Zanu-PF’s youth wing, which openly backs Grace Mugabe, accused the army chief of subverting the constitution. “Defending the revolution and our leader and president is an ideal we live for and, if need be, it is a principle we are prepared to die for,” said Youth League leader Kudzai Chipanga at the party’s headquarters in Harare. “US citizens in Zimbabwe are encouraged to shelter in place until further notice,” the US statement said. Zimbabwe has been on edge since Monday when Chiwenga, Commander of the Zimbabwe Defence Forces, said he was prepared to “step in” to end a purge of supporters of the sacked vice-president, Emmerson Mnangagwa. Mnangagwa, a former security chief nicknamed “The Crocodile” was favourite to succeed his life-long political patron but was ousted a week ago to pave the way for Mugabe’s 52-year-old wife Grace to succeed him. 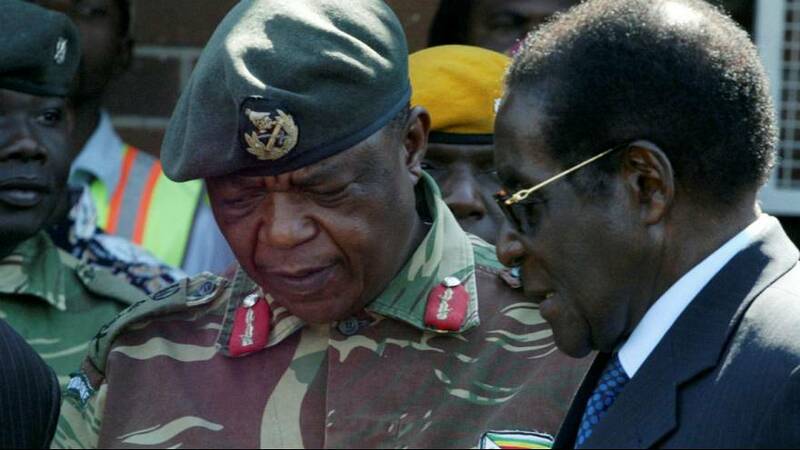 The previous day, Chiwenga had made clear the army’s refusal to accept the removal of Mnangagwa and the presumed accession of Grace. According to reports, Mnangagwa had been planning to revitalise the economy by bringing back thousands of white farmers kicked off their land nearly two decades ago. He reportedly also wanted to patch up relations with international organisations like the World Bank and IMF. The self-styled ‘Grand Old Man’ of African politics has led Zimbabwe for the last 37 years. He is the only leader Zimbabwe has known since it gained independence from Britain in 1980. In contrast to his elevated status on the continent, Mugabe is reviled in the West as a despot whose disastrous handling of the economy and willingness to resort to violence to maintain power destroyed one of Africa’s most promising states. Grace Mugabe’s rise has brought her into conflict with the independence-era war veterans who enjoyed privileged status in Zimbabwe until the last two years when they led criticism of Mugabe’s handling of the economy. What is wrong with the economy? A lot, according to experts. A chronic absence of dollars in the last year has led to long queues outside banks and an economic and financial collapse. Many fear this will rival the meltdown of 2007-2008 when inflation topped out at 500 billion percent. Imported goods are running out and economists estimate inflation could be running as high as 50% a month. “We are only targeting criminals around him (Mugabe) who are committing crimes that are causing social and economic suffering in the country in order to bring them to justice. As soon as we have accomplished our mission, we expect that the situation will return to normalcy,” Zimbabwe Major General SB Moyo said on national television. “Don’t try anything funny. Just go,” a soldier moves on a reporter in a car in Harare.